Martial arts classes teach confidence, deter bullies, and build friendships. Bullying is once again in the spotlight, both here and in the US. An incident in Western Sydney involving a bullied child who fought back and body-slammed his attacker to the ground made worldwide headlines. Most people who commented on forums and blogs were in support of his reaction. In the US, President Obama and the First Lady came out strongly in a special press meeting about the need for action on this issue. This meeting is posted on John Zimmer’s My Self Defense Blog. John’s blog post is an interesting read and inspired me to write this article. Watch for signs of bullying such as fear of going to school, lack of friends, missing belongings, torn clothing, sleep disturbances or nightmares, increased fearfulness and anxiety. Look especially close if the child complains of vague illnesses, such as stomach problems or headache on school days. The child may fear retaliation and keep the bullying secret for this reason. In Australia there is a fear of being labelled a “dobber” for bringing the problem to the school’s attention. Dobbing, ratting or snitching are negative labels used by the harasser to discourage children from reporting. It takes courage to report. Reporting is done to help keep someone safe. Let the child know the bullying is unlikely to stop unless you report it and get help together. Ask your child if there are any bullies at school. This is a good way of finding out about any existing or potential problems without asking them outright. A good place to start these conversations is in the car or other place where you have little eye-to-eye contact. Be aware of what is happening in your child’s life. Take the time to listen to them to acknowledge their concerns. Let them know it is okay to discuss anything with you, and that you will support them fully if they have any trouble at school, including bullying. Ask your child what they think is the best course of action if there is a problem. This helps them to feel like they have some control over the issue. Consult your child with any action or decision you take, as it will affect them directly. Make it clear it is not your child’s fault. Engage with the school. Introduce yourself to your child’s teacher and the principal of the school. If they know you, it is easier to discuss potential problems with them. Have a chat with other parents that have children attending your school and ask them if any of their children are being bullied? Another parent will often tell you about an instance of bullying at school simply because no parent wants to think of their child being bullied. Do not be afraid to speak up. It is difficult to catch a bully in the act in many instances, but if enough people speak up, a pattern will be noticed and something can be done. Give the school a reasonable amount of time to do something about the problem. Provide the school with something in writing. If the school has a written record of bullying, they are more likely to do something. The school will need evidence to discipline a bully. If there is any evidence of the bullying such as witnesses, bruises, etc. include it, as well as times and locations of the incidents. The vast majority of teachers and administration at schools take this issue seriously and will do what it takes to try and combat bullying. However, there are a few that have the attitude that “Kids will be kids”, and look the other way. If the teacher fails to accept responsibility, it is especially important that the parent get involved. It is also necessary to find another person at the school that has the power to do something about the problem. Try to control your anger over the incident. If you approach the school in a respectful, but concerned manner, you will have a greater chance of getting their cooperation. Set a good example for your kids by treating everyone in your life with respect and dignity. Do not allow bullying to occur in your home or workplace. The few times I have had to suspend students from martial arts training were usually related to their inability to keep their hands to themselves. Encourage your children to take a stand whenever they see bullying. Practice role-playing. Encourage your child to react calmly and confidently to taunting. Help your child understand that responding with physical aggression or insults will usually make the problem worse. For example, have your child practice saying “Leave me alone” in a loud commanding voice and then walking away. Teach your child how to show confidence rather than shyness and vulnerability. Children can learn to look people in the eye and speak up when they talk. Get your child into a martial arts program. There is truth in the saying “We learn to fight in the martial arts so we do not have to”. A martial artist walks with confidence, but rarely has to use their skills. Any bully can sense it. A lack of confidence plays a big factor in who the bully selects to intimidate. Another big benefit of martial arts is the friendship that is promoted in classes, and this will also help your child. Bullying is not something we have to accept. It should not be considered a “normal part of growing up”. It is damaging to the child’s psyche and can have life-long consequences. It leads to absenteeism at school and poor academic performance. Bullying has even contributed to youth suicide. Children should not be afraid to go to school or play outdoors. They all have a right to feel safe. Do you have any other ideas that will help parents deal with the problem of bullying? Kids Self Defence: When is it ok to fight back? Kids have the right to fight back if they are being attacked and hurt. 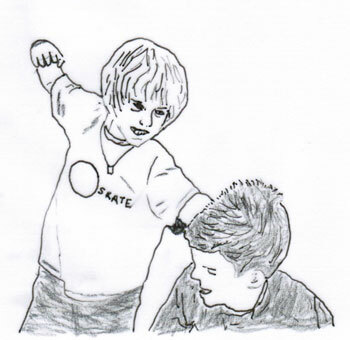 Should a child fight back in self defence when bullied? At least five or six times a year parents approach me and ask for advice on this. 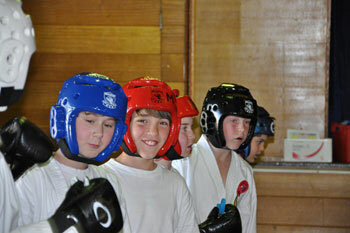 It is usually a beginner student, as our experienced students rarely get bullied. She explains that “since the sensei said it is not ok to use karate at school”, her son did not fight back when the bully kicked him. What do I tell her? First of all let’s define bullying. In this case, it means your child has been physically attacked by another child. It does not mean verbal attack, which should never result in retaliation with physical violence. If the bullying took place at school, teachers or administration will usually intervene. They do not want fighting at school. They understand that children need a safe learning environment. Many schools have instituted “no tolerance rules” where both combatants get suspended, regardless of who started it. It eliminates the problem of finger pointing as to who started it. Bullies will seldom take the blame and witnesses (usually friends) will lie to cover for their mates. Although many parents and students feel this is unfair, it does cut down on violence at school. Parents just want to ensure that their kids are safe. The vast majority of parents want their kids to stand up for themselves. I rarely encounter a mother or father who say “just turn the other cheek”. On the other hand, they do not want their children starting fights, so many kids are taught by their parents to fight only if another child starts it. If they fight back, they will get in trouble. If they do not fight back, they are more likely to be bullied again, not only by the bully involved this time, but also other bullies who will see the child as an easy mark. I have also heard kids say “my dad says if I don’t fight back, I’ll get in trouble at home too”. The child cannot win in this scenario. I make it clear that violence is not an acceptable way to solve our problems. There are many things the bullied child can do before hitting back. Among them; running away, getting the teacher’s help, blocking or evading the attack, or using words to calm the bully down. However, teachers and parents are not always on the scene to protect bullied children, and sometimes it is not possible to stop the bully without striking back. Every child has a right to defend themselves if they are attacked and being hurt. I tell the mother or father that it is ok to fight back if the child cannot escape and is in danger of being hurt badly, and if no one is around to help them. The child may get in trouble, but as I point out to the parent, the schools have a good idea who the bullies are, and if they are involved, in many cases the student defending himself or herself will receive more lenient treatment. I also agree with the child’s viewpoint that putting a stop to bullying sometimes means you have to be able to stand up for yourself. The first line of defence rests with the teachers. If physical bullying happens in school, report it to the teacher and principal. If it continues, write a letter. Putting something in writing is always the most effective way to get action. How do you feel about this issue? Is it ok for a bullied child to fight back in self defence? This is the second anti bullying video for kids in our series to help you learn how to protect yourself. It will have you “bobbing” and “weaving” just like a pro boxer in no time. If practicing this move at home, make sure the punches are slow enough so you can learn without getting hurt. Notice all of these videos are for defence only. You must have a qualified martial arts instructor teach you the more offensive moves. I hope you like this video. Please check out Kids Anti Bullying Secret Tip #1 too. Look for more of these videos on YouTube.